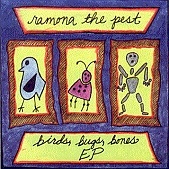 RAMONA THE PEST play hard hitting and airtight pop. RTP demonstrates that a veteran unit with top notch song writing skills and loads of talent is a band that you can trust to deliver the goods time and time again. This band is so damn good that radio is never going to discover them in spite of their being perfect for the airwaves.